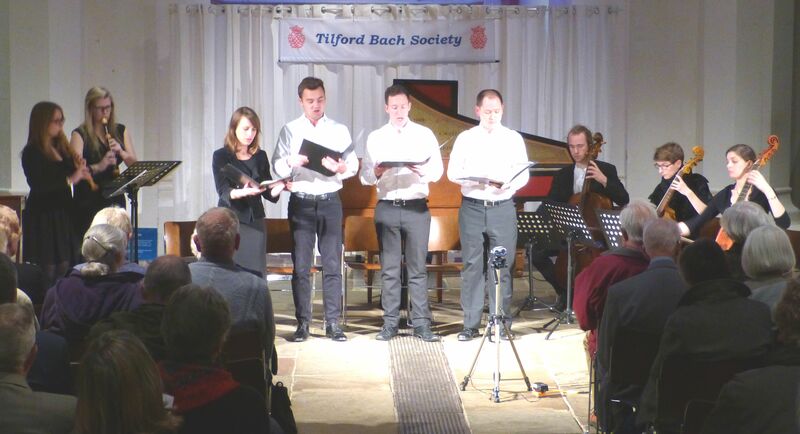 Graduates and students from the Guildhall School of Music visited Farnham Parish Church for the Tilford Bach Society’s April concert. Four singers and seven instrumentalists performed music from the baroque period by Telemann, Buxtehude and J S Bach using authentic instruments; recorders, viola da gamba, violin, cello, harpsichord and portative organ. Sonatas by each of the three composers used different combinations of instruments; a trio sonata by Telemann exploiting the delicate sound of two recorders with harpsichord, a Bach sonata with a brilliant violin solo and a rollicking final gigue. This also included a sparkling harpsichord section, giving Sotoko Doi Luck, who accompanied every item in the programme, a rare moment of personal glory. The concert began and ended with vocal works, opening with a joyful short cantata for soprano by Telemann and closing with a more substantial Bach cantata for all four singers and full instrumental ensemble; ‘God’s Time is the Best Time’. It is a passionate declaration of faith, movingly performed by Roberta Diamond (soprano), Collin Shay (countertenor), Daniel Thomson (tenor) and Adrian Horsewood (bass). The triumphant closing chorus, ‘Glory, praise, honour and majesty’ resounded joyfully around the gothic arches. The Guildhall Cantata Ensemble (coached by James Johnstone) draws on members of the Historical Performance Department at the Guildhall School of Music & Drama. In 2013 they celebrated John Dowland’s anniversary year at Hatchlands Park as part of the Guildford International Music Festival. They have made regular appearances at St.Martin in the Fields, Christchurch Spitalfields, Blackheath Concert Halls and at the London Handel Festival performing repertoire ranging from 15th century songs to Bach cantatas. In 2015 they premiered the first modern day performances of Charpentier’s chamber opera, Actéon changé en biche. 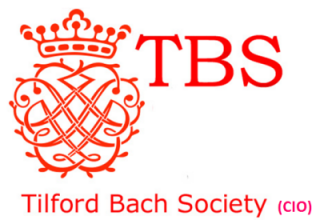 In this programme, devised by Mirjam-Luise Münzel, the ensemble collaborates with Ensemble Tocando to present some of J.S Bach’s chamber masterpieces and the most beautiful Cantata BWV 106 (Actus Tragicus), as well as unknown treasures by Bach`s two great contemporaries Telemann and Buxtehude. The special sound world and dialogue in between recorder and viola da gamba, which merges beautifully with the voice, is one of the main topics of the programme. Ensemble Tocando: Tocando – from Spanish , means `playing an instrument` and at the same time `touching` in both senses, touching body and soul. Japanese, Mexican, Australian and German spirits come together in this group of young musicians from all over the world who are all passionate about Early Music and met in London, where they all studied at some of the most prestigious music colleges in the world. The ensemble is specialised in the German and French cantata and chamber repertoire of the high baroque era and was supported and coached by leading professors and performers of the Early Music scene such as James Johnstone, Steven Devine, Karel van Steenhoven and Emma Kirkby. 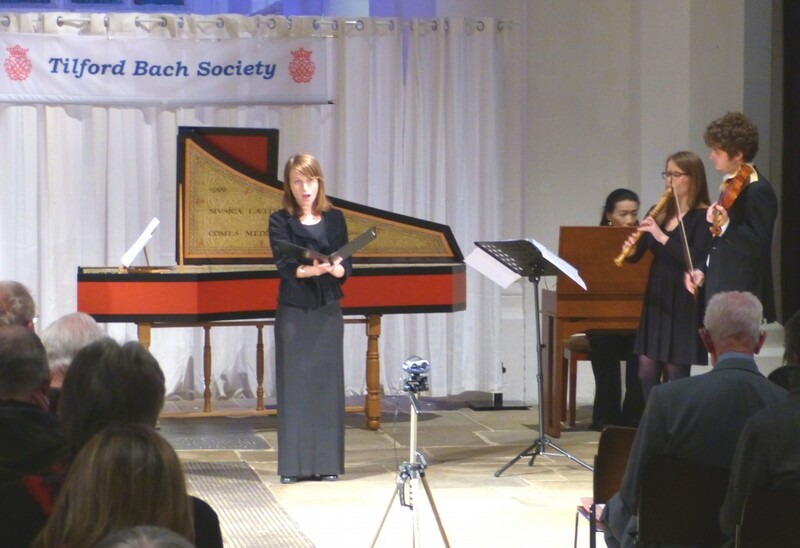 Recent performances include a concert within the London Bachfest at St George`s Hanover Square.